I love Peanut Butter and Chocolate! If you are LOVER of these ingredients you definitely need to try this one out!! 1. Cream together the Peanut Butter, Butter and Vanilla until soft and smooth. 2. Add the Powdered Sugar and blend well, then add the Graham Crackers and mix. 4. Spread in a 9x13 inch pan. 5. 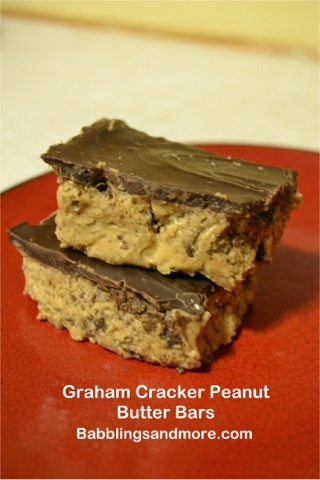 Melt the Chocolate Chips and spread over the top of the Peanut Butter mixture. Refrigerate until firm, then cut into bars and serve. My Little Legs Giveaway Winner! !